last year in push to be 'experience-focused' and to align the business with sister agencies around the world. This meant it dropped former owner Harold Mitchell's surname from the agency he founded 41 years ago, and four years after he sold the business to the Aegis Group. Tangas will join the business next month from from comparison site iSelect, where she held the group executive of its energy and telco industry since 2015. Roeling left Dentsu X in November to take a role as president of Amplifi, Dentsu Aegis Network's media investment arm. 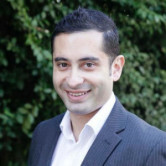 Tangas is a digital strategist with years of experience at the compare website iSelect and directories and search business Sensis. She will report into DAN ANZ chief executive Simon Ryan and joins the group's board. “A highly accomplished digital leader, Angela has established a solid reputation as a trusted senior advisor and thought leader with the drive, passion and determination to deliver innovative outcomes,” Ryan says. Until Tangas takes the reins of Dentsu X, Corina Cosma (GM of Melbourne) and Lyndall Black (GM of government services) will continue to lead day-today operations. Anglea Tangas and Simon Ryan. Angela Tangas has been appointed national managing director of Dentsu X, replacing Adrian Roeling. Dentsu Mitchell rebranded to Dentsu X in November last year in push to be 'experience-focused' and to align the business with sister agencies around the world. This meant it dropped former owner Harold Mitchell's surname from the agency he founded 41 years ago, and four years after he sold the business to the Aegis Group.